We’re thrilled to announce the launch of the Project Shivom. Over the last few years, genomics and blockchain have reached the potential to significantly improve global healthcare. Genomic medicine has huge implications for the understanding and treatment of as many as 7,000 rare diseases, as well as cancers, complex disease such as cardiovascular and neurodegenerative, and infections. 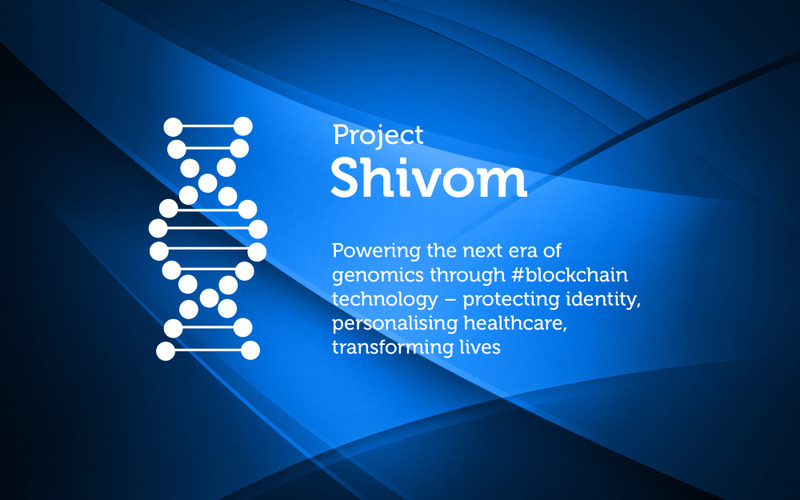 Project Shivom is the next evolutionary step in this development by creating a medical genomics ecosystem on the blockchain. For the first time ever, an ecosystem will offer an open web-marketplace for other providers to add not only genomics information, but also analytics, and associated apps and services to drive personalized medicine. We further aim to extend our services to form a global network of associated laboratories and research centers, as well as genetic counselors and other relevant services. On top of this global ecosystem, we will build a not-for-profit R&D organization to serve the underserved, and deliver genomics sequencing technology and targeted health care. Leveraging blockchain technology, the research institute will be based on collaboration and open-innovation, that optimally connects patients, clinicians, researchers, insurers and clinical laboratories to one another. The Shivom platform works on principles of collaboration, openness, and integrity allowing patients to own their genomic data, have full access to it and monetize it on the blockchain. Blockchain technology is ideally suited to address most trust issues, such as patient consent, unclear data ownership, data integrity, or user authentication, enabling complex data rights management and fine-grained access using smart contracts. Using state-of-the-art blockchain technology means access to improved data security, easier data sharing, increased patient engagement, better quality ‘big data’ analytics, enhanced R&D processes, and artificial intelligence-based diagnostics for all participants. Our vision is for Shivom to be the largest genomic data-hub on the planet. In doing so, this new massive ecosystem will create value for individuals, not-for-profit organizations, governments, and for-profit entities. We strongly believe that Shivom will change the fields of genomics, health care, and personalized medicine, for those in remote communities, and for the global system. We urge feedback on our project and whitepaper, and are excited to share further development news with you as it becomes available. Blockchain technology has transformed a number of industries in recent years and has the potential to revolutionize many more as the public increasingly embraces its benefits. Quite simply, a blockchain is a distributed tamperproof database, shared and maintained by multiple parties simultaneously on multiple systems. The database keeps secures the records that are added to it sequentially via links to private data, including personal healthcare data. Each file in the database contains a timestamp and secure links to the previous record. Records can be added to the database, but not removed, with each new record cryptographically linked to all previous records in time. New records can only be added based on synchronous agreement or “distributed consensus” of the parties maintaining the database. By doing so, it is impossible for one party to manipulate individual records. This type of process eliminates the extensive need for trust because participants in the blockchain can have mathematical certainty for every digital asset that constitutes the system you want to protect. Blockchain technology will revolutionize healthcare. When storing healthcare data using a blockchain database, cryptography is used for encrypting the contents of a message or transaction, so that only intended users can open and read that content. The encryption process works via ‘Public Key Cryptography’ or asymmetric cryptography, an encryption system that uses pairs of keys. A “public key” may be disseminated widely to everyone, while a “private key” is known only to its holder. Either key may be used to encrypt a message, but the other key must decrypt the message. In this way, a patient can encode their healthcare data, including genomic data with a public key and be sure that only the holder of the private key can decrypt it. Second, the data can be encrypted with a private key. If the data, e.g. a hospital discharge letter, makes sense when it is decrypted using the corresponding public key, it is guaranteed that the holder of the private key is the party that encrypted the data. Such a process is equivalent to “signing” a message because it is analogous to someone putting their unique signature on a document. A cryptographic key generator is used to begin generation of a pair of keys suitable for use by an asymmetric key algorithm. Anyone can encrypt data (eg private genomic or health data) using the public key, but only the holder of the paired private key, for example, a researcher or the patient’s physician, after consent by the patient can decrypt and hence access to the genomic data. Blockchain technology, in the form of a universal model for record keeping and data storage and access (a secure, decentralized, pseudonymous file structure for data stored and accessed in the cloud) is the technology that is needed to move into the next phase of industrialized genomic sequencing. At Shivom, we are working towards making this a reality. We aim to be at the forefront of data security and cryptography and our team works in close collaboration with leading cryptographers to add additional security levels to our platform that go well beyond using a blockchain for decentralization. It is necessary to integrate security and privacy into the design of an IT-platform (preventive action) as opposed to perceiving it as an addition to a developed business solution. We will also work on algorithms to implement a so-called proof of liability that makes it possible to identify a user who does not follow the playing rules e.g. by attempting to commit fraud (e.g. uploading data from another person). This will enable Shivom to be the safest, most robust health care and genomic data record and storage infrastructure globally, and enable collaborative R&D and precision medicine across healthcare systems. Kami perhatikan bahwa banyak dari Anda telah bergabung dalam daftar putih kami dan telah mendaftar untuk acara presale yang dijadwalkan untuk ditayangkan pada 16 April 2018 pukul 1 siang GMT. Untuk melanjutkan perjalanan Anda sebagai bagian dari komunitas kami, kami sarankan Anda mendaftar di Dasbor Tokensale kami sesegera mungkin untuk memastikan bahwa pembelian token OmiX Anda berjalan dengan lancar. The Shivom team is there to answer any questions you may have or any assistance that you may need with KYC procedure.